»Bangalore To Yercaud - Trip To The Jewel Of South! Bangalore To Yercaud - Trip To The Jewel Of South! Yercaud is a quiet and picturesque hill station, settled in the Shevaroys range of hills in the Eastern Ghats, in Salem district of Tamil Nadu. The town, also known as "Jewel Of South", is largely made of untouched natural resources. Yercaud literally translates to 'Lake Forest', due to the beautiful shimmering Yercaud Lake which is surrounded by lush forest. Situated at an altitude of 4,970 ft above the sea level, the town is known for its coffee and orange plantations which are found in abundance, adding to its green beauty. Owing to the hilly ranges, it also is famous for adventure activities such as trekking, camping and dirt biking. With the right blend of nature and adventure, Yercaud can be your perfect weekend destination! The ideal time to visit Yercaud is between the months of October to June. However, if you wish to visit the annual seven-day Summer Festival, which includes dog shows, flower shows, boating and various other activities, then May is the month to visit. We recommend Route 1 since it is shorter and faster. Read further about the places to visit and things to do on the way. Hosur is an industrial town located about 40 km from Bangalore. During the pre-independence period, The British referred to Hosur as "The Little England" due to the pleasant weather, that prevails almost throughout the year, similar to the climatic conditions of England. Rajaji Memorial and Pratyangiri Temple are the two tourist hotspots in Hosur. Pratyangiri Temple is known for the enormous statue of Pratyangiri Devi that is displayed on the Rajagopuram, or the pinnacle of the temple. Rajaji Memorial is a small house that belonged to C Rajagopalachari, which has now been turned into a memorial by the Karnataka Government. Shoolagiri, located 25 km from Hosur, gets its name due to the Trident (Shoola) shaped hill that dominates the town. Shoolagiri has a less-explored forest nearby, which houses many species of birds and animals. Tortoises under lake-side bushes and birds such as Hoopoe, a woodpecker with feathered crown, can be seen. Varadaraja Perumal Temple, dedicated to Lord Vishnu is located at the foothills of Shoolagiri. Krishnagiri district of Tamil Nadu, located 94 km from Bangalore, is famous for growing mango crops, owing to the fertile land and availability of fresh water. Mango Festival is, therefore, famous at Krishnagiri, which is held in the month of June when the delicious varieties of mangoes are sold every year. Krishnagiri Dam (KRP Dam), a popular tourist destination in Krishnagiri, spans the Thenpennai River. A beautiful park that is maintained right next to the dam, is a perfect spot to relax with family or friends. Krishnagiri Fort built by King Krishnadevaraya and the Krishnagiri Shaktipeetam are the two other spots to visit in Krishnagiri. Nearly 49 km off-route in Dharmapuri and 180 km from Bangalore, lies the breathtaking Hogenakkal Falls, on the banks of river Kaveri. Hogenakkal literally translates to "smoky stones", due to the mistiness created by the force of water against the rocks. This majestic waterfall, sometimes referred to as "Niagara Falls of India", is a major tourist attraction. Boating is available near the falls, and some locals even offer massages to your tired body! Theerthamalai is a prime holy spot located on the Harur Taluk of Tamil Nadu. IT houses Shri Theerthagirishwarar Temple, built by Chola and Vijayanagara dynasties. This temple is built on a hillock and is about 66 km off-route in Dharmapuri district. Since it is dedicated to Lord Shiva, the temple is crowded with devotees during Mahashivarathri. Read further to know about places at Yercaud. Yercaud Lake or Big Lake, is beautifully surrounded with the view of hills and forest, along with lush gardens and parks, making it a perfect picnic spot. It is a man-made lake, sometimes also referred to as Emerald Lake, with a fountain in the centre. There are rowing boat and pedaling boat facilities available. 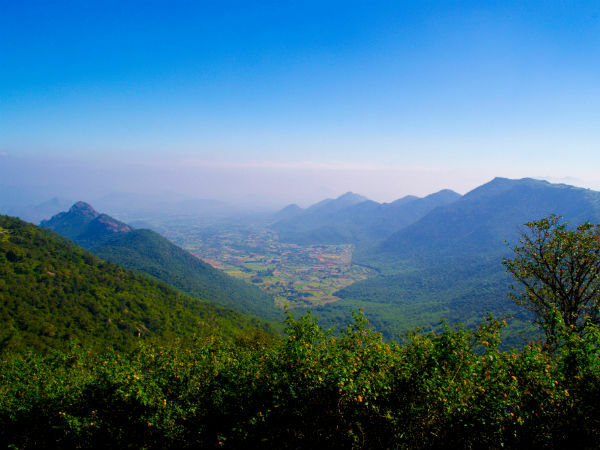 The towering range of Shevaroy Hills, originally known as the Servarayan Hills, is the highest point in Yercaud. It houses the Shevaroy Temple, dedicated to Lord Servarayan, in a narrow cave. The view from this point is awe-inspiring to say the least. Lady's Seat, Gent's Seat and Children's Seat are the clusters of rocks found on this hill, which offer a panoramic view of the Salem town. A viewing tower with a telescope is available, from where this view along with a clear sight of Mettur Dam can be seen. The enchanting Kiliyur Falls is located about 3 km from Yercaud Lake. Water from the Big Lake and Shevaroy hills flows into the Kiliyur valley, which then falls from a height of 300 ft forming this waterfall. It is an ideal location for trekkers, and it takes over an hour to trek through the forest, just to reach this place. Loop Road, a 32 km road lined beautifully with trees, is the place to be if you love driving. It is an uphill drive consisting of 20 hairpin bends, making it an exciting and fun-filled drive! It is a popular spot for early morning drives among the locals. Pagoda Point, also known as Pyramid Point, is another spot for a scenic vista of the Salem Town. The name comes from a stone structure made from a pile of four stones, which looks like a pagoda or a pyramid. A temple dedicated to Lord Rama is found near this point. Pagoda point is located on the eastern side of the hills. National Orchidarium in Yercaud is one of the largest orchid nurseries in India. It houses up to 249 types of orchid and many other endangered species of plants. The place is also good for bird-watching, since birds such as kites, bulbuls, partridges, etc., are found here. An interesting visit for young minds would be the silk farm of Yercaud. Located close to Lady's Seat, the farm gives insights on the rearing and feeding of silk worms, and how silk threads are woven through its cocoons.